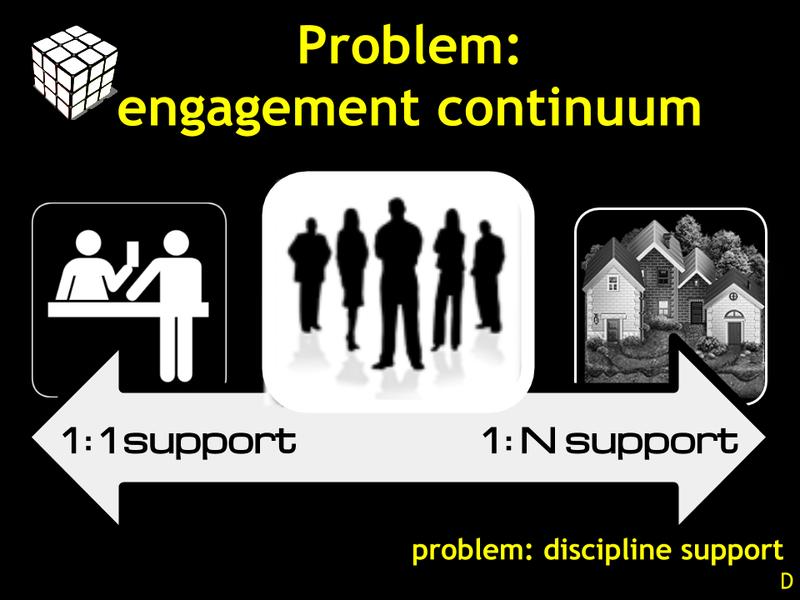 The following is a simplified version of the model that Dr. Manos is experimenting with to cope with this continually changing population; so that Researchers are not disfranchised from the technology they use (and most importantly the support they need in using those tools). There are four parts to our presentation, which can be summed up as: we want to tell you about our new model which is made up of two essential parts a.) researchers are becoming more and more dependent upon tools to do their work, b.) they like to learn about these tools from one another. To help explain this new model we present some examples of events we’ve done the past year to bring researcher together in the same room around the same tool. 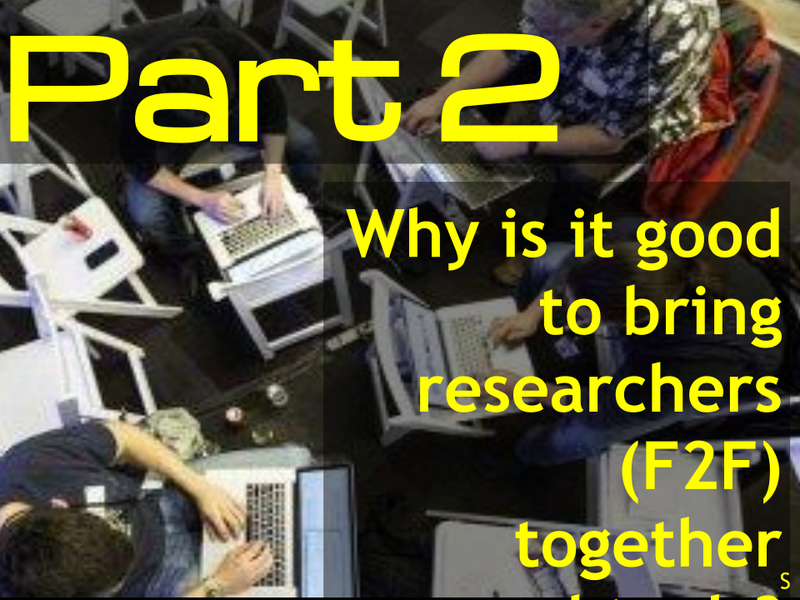 Finally, we would really love it if others could start sharing how they are engaging researchers using a similar models of ‘peer to peer’ & ‘face to face’ activities to engage researchers and their problems. So why are we proposing a new model for how IT should be engaging researchers? In short, because “computer says no”. University IT helpdesks usually do not have the best reputation with the researchers they serve. This is not to blame the current helpdesk model, as it is functional for doing basic IT support. However, IT helpdesks will never be a good option for engaging researchers given the complexity of problems that researchers face. We know that researchers don’t like ticket based helpdesks, and we know that researchers aren’t willing to all get on bookface and talk about their problems to the world; where is the happy middle ground? How can we create a social situation where we do support researchers and the bespoke solutions they require? What is a good way to organise researchers so they get good IT support?! It’s sometimes hard to imagine a different social solution for organising researchers together than our current faculty based system. 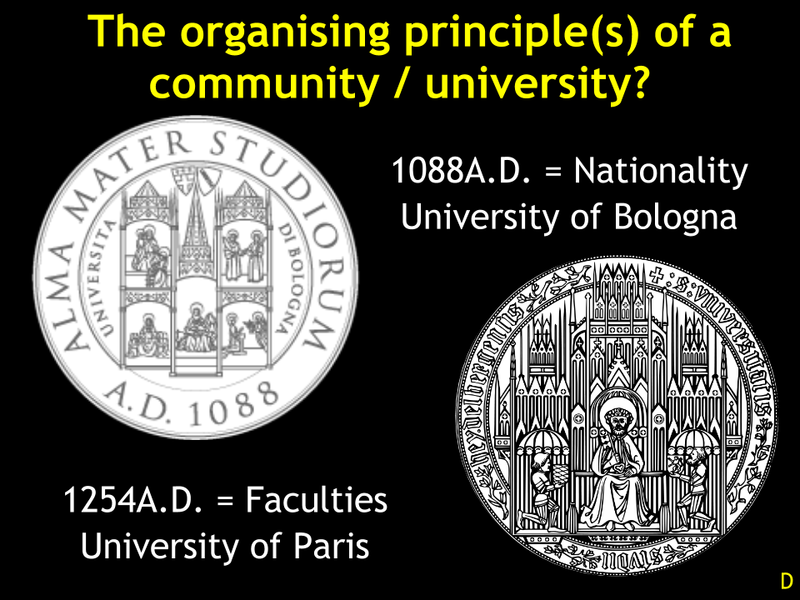 However, faculties were not the original ‘organising principle’ of the University. In fact, ‘Nationality’ was the original organising principle at the University of Bologna when it was first established in 1088A.D. It wasn’t until 1254A.D that The University of Paris started experimenting with the organisation of the University via “Faculties” . Even then the composition of those faculties around subject, discipline, etc. took hundreds of years to spread to other Universities. 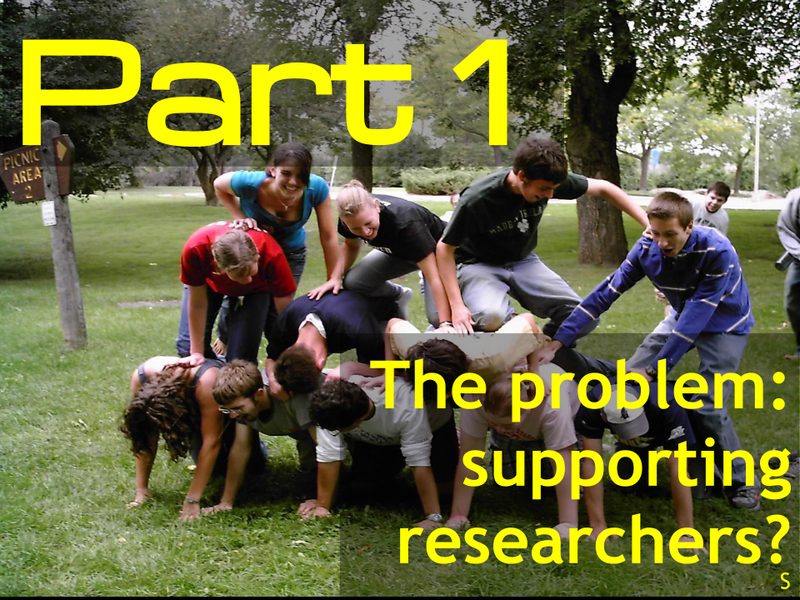 Is it time that we used a new organising principle for bringing researchers together? 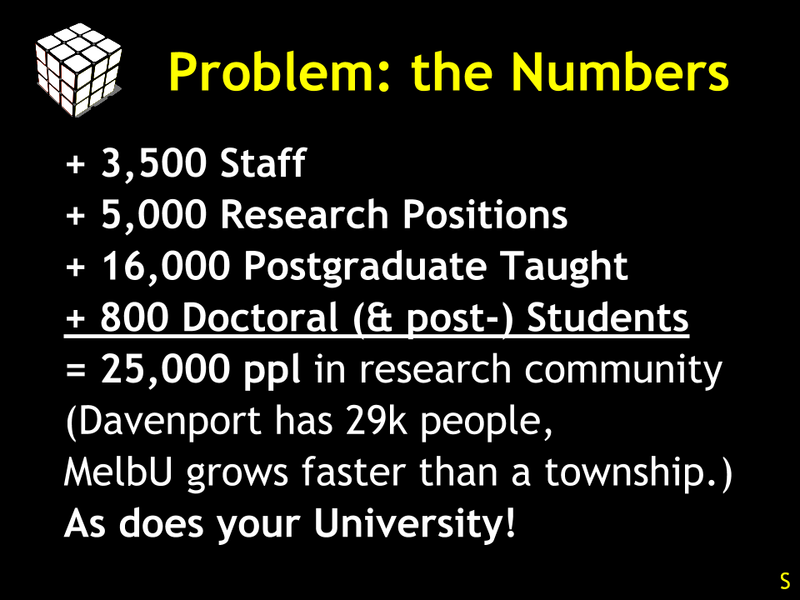 So don’t get me wrong, we are not suggesting that we should decamp all the faculty offices and make all the researchers move to a building that shares common toolsets, e.g. The College of R, The College of Matematica, The College of SPSS, etc. However, we are suggesting that all researchers can be grouped by the tools they are utilising to do their research. 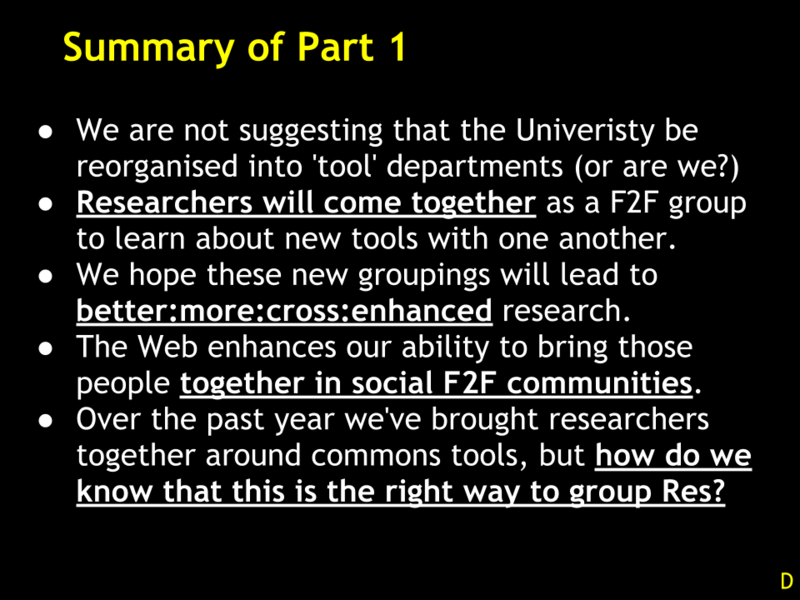 And better yet, the Web give us an incredible organising tool to bring researchers together around their favorite tools. But please remember, that while we feel the Web is a great tool, we do not believe it is sufficient to enable researchers to share their ideas – it is only via face-to-face means that true sharing (and support) of research ideas and tools can effectively occur. This new model is very easy for you to attempt at your institution. All it takes is the awareness of what tools that researchers are using across various disciplines, and second it requires that you bring these people together to improve their skills in that tool. Though, once you’ve done that you’ll realise how different each of those activities can be, ergo, what kind of quality IT Research service are you providing through these activities?! This is where our new model gets tricky. We have had some success for bringing researchers together this past year around the tools they use, however we want more evidence that this is a model worth pursuing (and one that can be justified to the Provost, e.g. the helpdesk can post an annual report metric for ‘numbers of tickets resolved’; our model needs a similar established number across the sector alongside other interdependently validated evidence <– this is where we need U!). Rich in Rooms: getting rooms at a University are cheap (if not free) and so there is very bureaucratic barrier to experiment with this model. Rooms are also a great barter tool for getting outside groups (companies, entrepreneurs, etc) to come along and provide their help in exchange for the room. 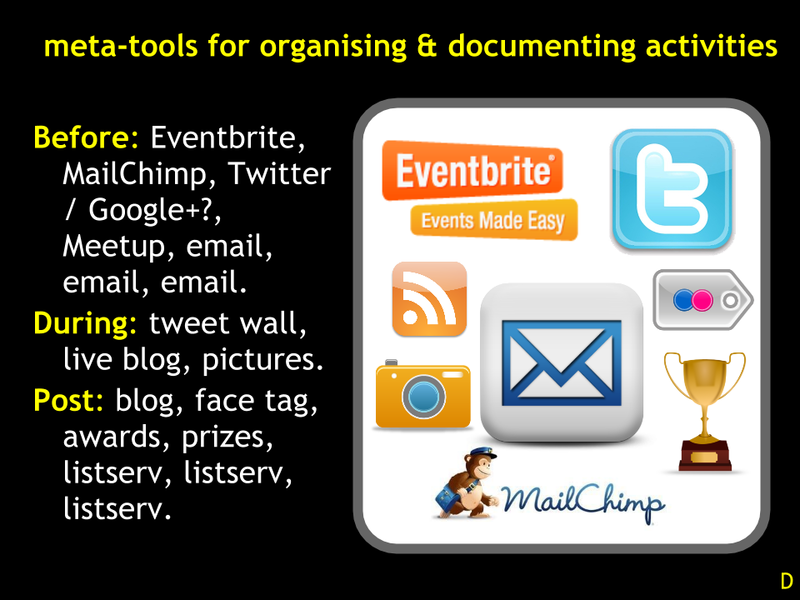 Don’t be a tool: some disciplines will have hundreds of tools (e.g. our neuroscience department at last glance has over sixty tools they are using in various work). Realise you’ll never be able to hire enough staff to support all these tools, so embrace this (don’t constrain because the tool isn’t ‘officially supported’). Tools as lingua franca academica: a growing trend is the use of common tools that cross discipline boundaries. Tools like R, Matematica, Google Fusion Tables and many more are enabling new collaborations with researchers. Don’t be afraid to bring a Historian and a Scientist into the same room with one another if they are using the same tool! Trade trust: Being IT, you should expect to have reistence at first as IT are often seen as ‘enforcers’ – this can only be changed by showing how you can help and that you are actually a ‘collaborator’. The porous University: community groups and events allow anyone to participate, not just inclusive of world class researchers & their post-grads but those entrepreneurs, business and other industries around the University. Learning is social: the model we are proposing is not actually a new one, the heyday of Universities (in the 1920-30) was filled with social clubs, dinners, discussions and all kinds of activities that many in the University sector would see as too “informal”. 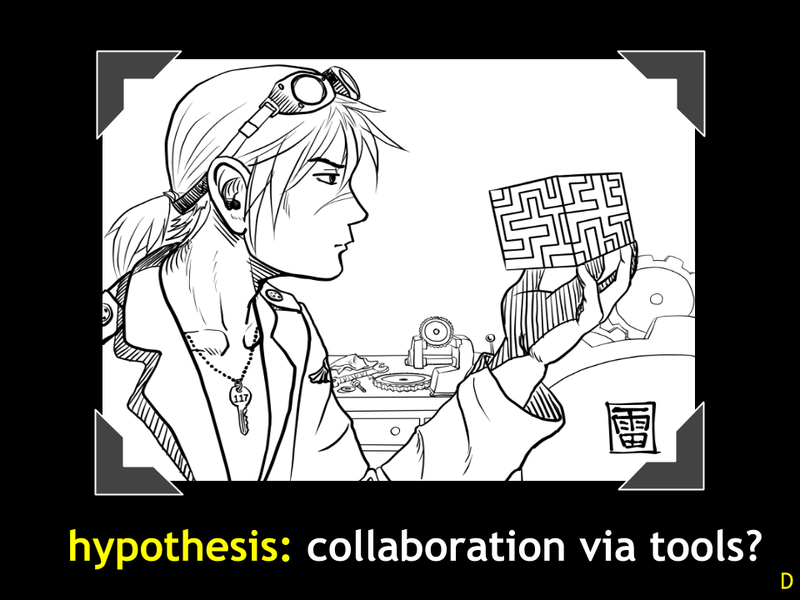 Yet, for researchers to work with one another they require a close trusted relationship with one another. The activities we are suggesting enable this relation to be created. 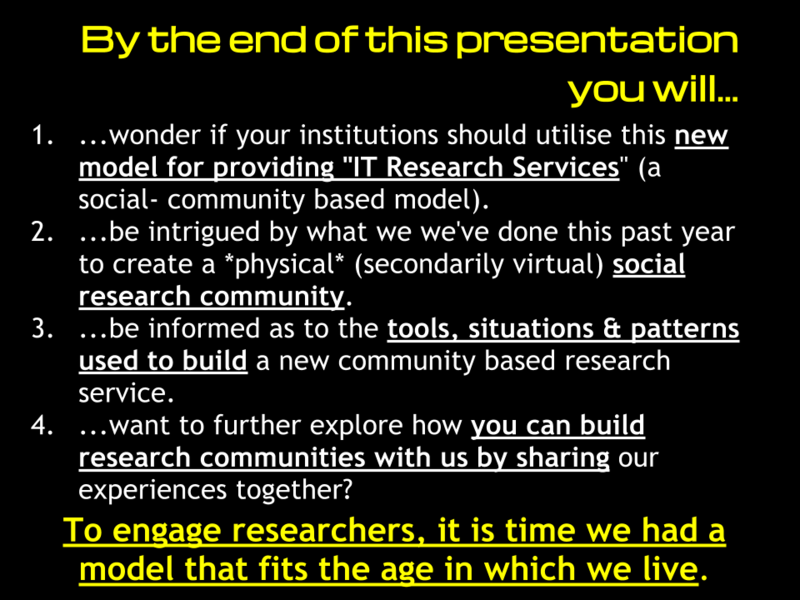 Scale: You’ll recall the numbers at the start of this presentation and how many researchers that the research IT service must support? This model has enabled us to start several communities which are then taken forward by other researchers, and further branched off. The simple value of establishing this model so that anyone can support one another around tools is viral and can spread to much larger numbers than any single helpdesk. Ok, so we’ve told you some of the reasons why we think this ‘new’ model works. Now we want to get you to go away and try it on your own. To help you do this are a list of activities we’ve undertaken this past year as well as some future activities we plan on doing. The following list is only a sample of the events we have done, please feel free to use the tags (denoted by the “#” symbol) to search for more information. Activity no.1: Emerging Technology Forums – This is our “home base” monthly event where we ask researchers whom we’ve newly met (from the below activities) to come and present the tool they are utilising. In this way we can gauge if there is greater interest to put on a further event around tool we were not previously aware of being used. Activity no.2: Cloud Dojos (#nadojo #uberdojo) – These events are based on ‘problem based learning’ where the researcher brings their tools+data into a room of developers and other experts to try and solve the problem together, while at the same time learning about a new tool. Activity no.3: Stories about people – This is a promotional event where we are able to video record a real human story about a researcher and the tools they are using so that we can show how the community is more than just technology – people make food, have babies, tell jokes and genuinely want to share their experiences beyond ‘just the data’. Activity no.4: Build Parties (#pif3dau #pif3d) – new technologies like 3D Printers offer an incredible opportunity to engage researchers who are looking for new opportunities to experiment with how their research could be extended. These build parties bring together a vast array of different cross disciplinary researchers. Activity no.5: Celebrity Lectures (#TBLDownUnder) – Having Sir Tim Berners-Lee give a public lecture brought in over a thousand people, of which many are returning to our events to learn more about the collaborative opportunities we provide. Activity no.6: Data Newsroom (#DataHack) – Engaging with organisations like The Age newspaper enable us to get reserch out to the wider world that would otherwise we stuck in the Academic silo. In addition, this participation with people outside of Academia further increases our reputation as well as provides new commercialisation opporunities. Activity no.7: GPU Seminars: Groups often spin off of previous events we have done and all we need to do is provide a room and help promote the event, the rest is taken care of by the researcher who want to tell other researchers about the tool they are using and its success. GovHack – another event that enables researchers to work with a wider audience as well as find new research opportunities via the large amount of government data becoming available. Art Galleries (#ArtsHack) – Turning research into art is a very powerful way to enable resarchers to socialise with one another. This builds trust and gets people out of the formalness of the Lab, Lecture or Learned society. Jerry Springer-esque Academic Debates – Why not have a bit of fun while debating new topics, best of all these kinds of exciting events get people partiicpating and talking in a topic that they might otherwise dismiss as outside of their research remit. Silent Auctions – There are opportunities to get Alumni involved as well as interested in the investment opportunities of new research ideas. Accelerator Week – Getting research ‘accelerated’ into a product that can be presented to Venture and Angel investors is a whole new way of making research commercial. To sum up the above activities, it is important to note that we are still exploring how to best make these activities work so that we can actually make the valid claim that research is better because of our support. We still don’t have the evidence we need to demonstrate that this is the way that all Universities should be approaching the support of researchers in the modern day digital tool world. So why change the current model for Research IT Services? Because the world has changed because of technology and there are better ways to engage people in using technology. 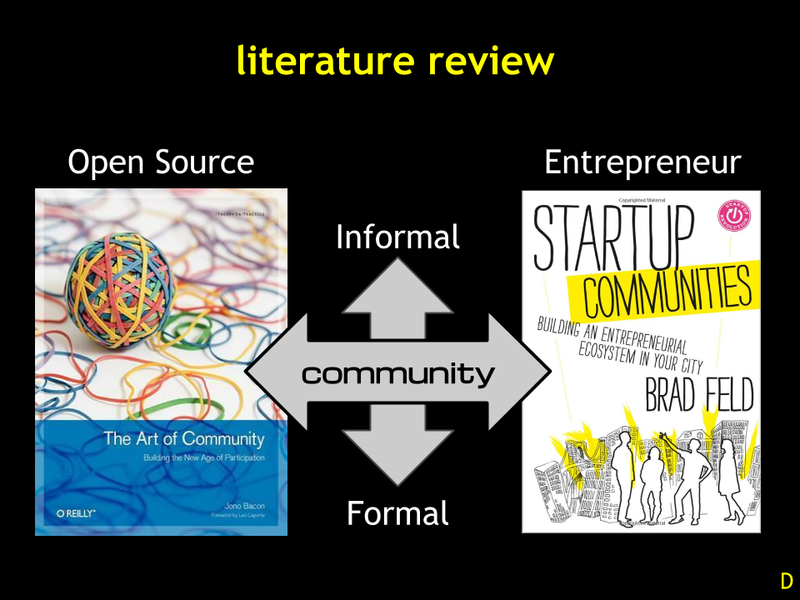 We know this because we’ve started to see this same model we are recommending appear in the Open Source community as well as the Venture Capital & Startup communities. These new models for working don’t tell us explicitly how to adapt a new model, but they do give us a guiding light so that we can support research in the modern digital era. So what do you think, is this new model worth exploring? Is it something your institution could ‘have a go’? How can we help you try it out? Please do tweet us or leave a comment below. 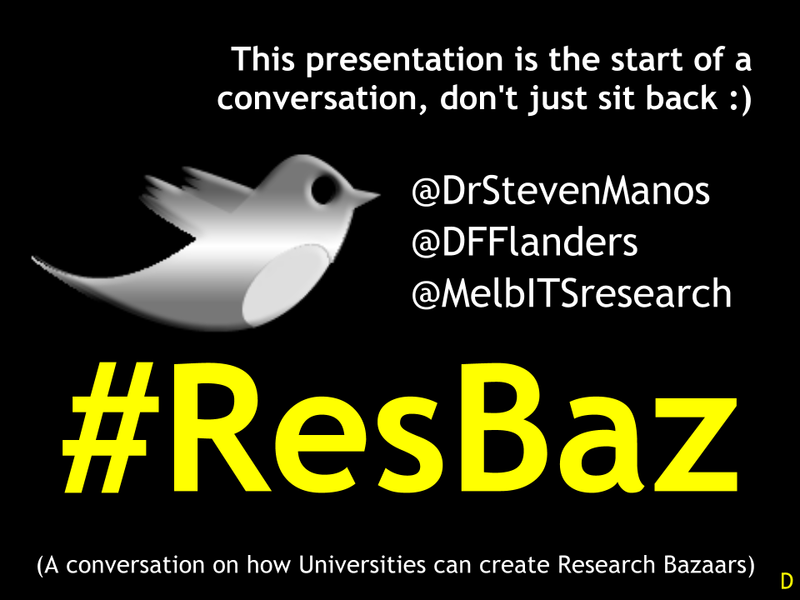 We’ll be monitoring any mention of the tag #ResBaz so please do help continue the conversation. Please click this link for the full version of the above slideshow presentation. ~ by dfflanders on April 15, 2013. Below is a re-publishing of some comments from my friend @spetznatz (Steve Androulakis) on twitter. I’d welcome further questions as I’d like to get a #ResBaz FAQ going to help explain what is rightfully identified as a retro-model. The problem is that most Universities / Government strategies aka funding don’t align with supporting the #ResBaz model – something @spetznatz himself identified at a #SIITS meeting almost two years ago). 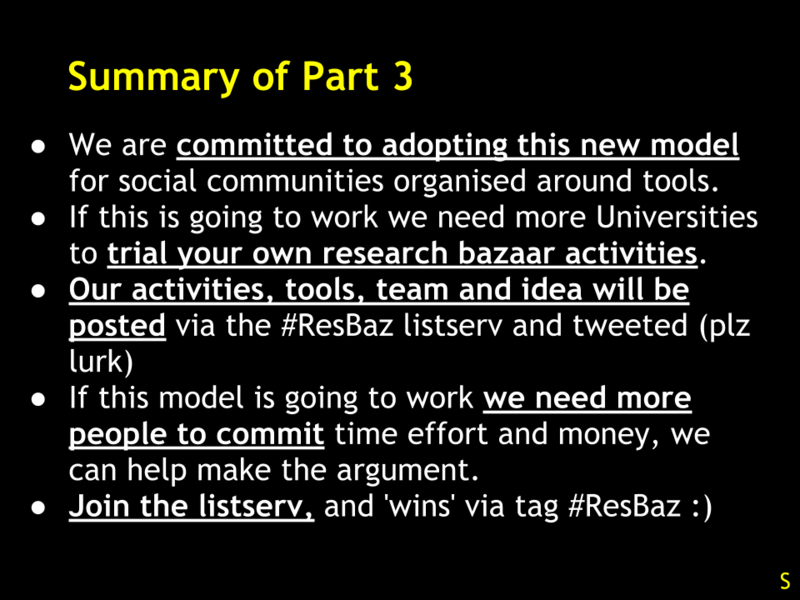 A (from @dfflanders): Agreed, a good eResearch Centre will be doing the #ResBaz model already ‘in practice’ – however most ‘groups’ supporting researchers (be they local departmental IT supporting researchers, institutional wide ‘centres’ or support librarians), don’t explicitly state the #ResBaz engagement method (or something like it) in their strategy (nor do we have standard metrics for saying why this is the way to do it, and therefore prioritise a budget for it). b.) engage researchers in face-to-face scenarios so as to bring researchers together from separate disciplines / backgrounds / experiences. “ResBaz” is a hypothesis (something you and I ‘feel’ is the right way to do things), however like good scientists we need evidence if we are going to prove the hypothesis. NB Finally, to help nuance #ResBaz as a “method” I’d suggest that #ResBaz is a method that any eResearch centre could adopt under their current tactics; in the same way that any ‘Agile’ project could adopt “scrum” as their method. So again, this isn’t anything massively new, it is mostly a subtle revolution where we see prioritisation of strategic budgets so they can support what most of us have experienced as the ‘right way’ to support researchers with IT. Q: “…the more general groupings of people from different disciplines (e.g. MatLab) is not massively done. A: Bingo, this is the *key* lesson from the events we’ve put on this past year; it should not be passively dismissed as the core strategy in providing researchers with IT (“researcher consume collaboration, not services”) – organising researchers around tools is horribly simple, but it needs to happen more explicitly as well as with more evidence supporting the value it achieves (if it does achieve value?). The only other semi-novel thing about #ResBaz is the declaration that we can’t teach researchers how to use their tools via online platforms (video conferencing, virtual “helpdesks”, bookface-like social media platforms, interactive tutorials, etc). Researchers have problems that are “higher bandwidth” than what computers can currently support in terms of human communication. Though of course the Web is a great way to get people to come together F2F (e.g. eventbrite, twitter, mailchimp are all tools that can bring us together to solve the problem). A: I’m actually ‘stepping out’ and saying that a “research tool centric approach” is how we should be enabling researchers to use more data. Its easier to get the researchers together in the same room if you tell them you are going to show them how to better use their tools. It is not as effective to try and get a bunch of researchers to come and look at a spreadsheet with one another (let alone cross-disciplinary researchers) – the tool provides the layer which makes the data discursive? As for re-framing the activities, this is also true. 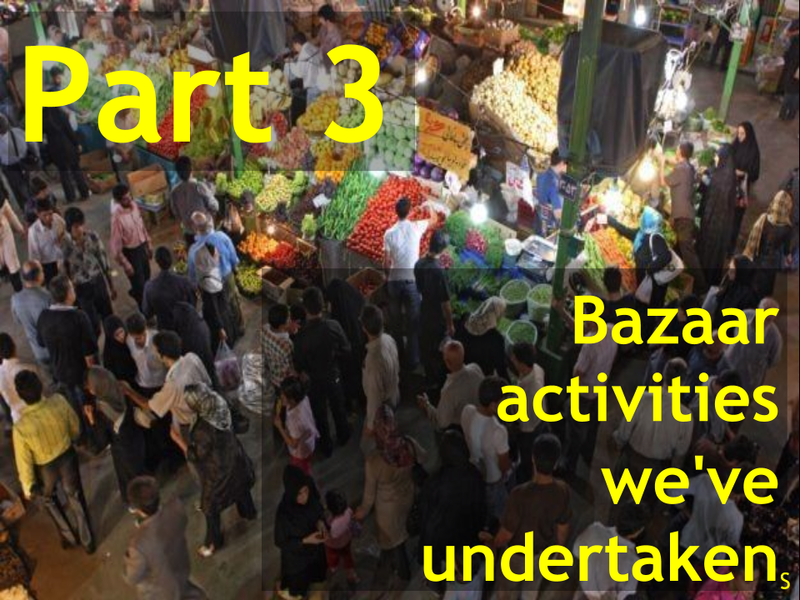 I spent the last month crafting this presentation as a reflection on the dozen some events we did: from the thematic analysis of all these events the #ResBaz model was the ‘theme’ that came out as the dominant pattern. Though again, this is me putting out a hypothesis, the data for this method still needs to be collected; as we don’t know if a #ResBaz model result in more/better/cross/enhanced research <– we need metrics for this in the same way that an IT helpdesk has a common 'tickets' metrics for queries answered. = One of the more inspirational bits of history was these pictures in the Melbourne University archive that hisnts of the social milleu within the University (pre war). Also of note, is the Oxford & Cambridge model where the colleges are still organised around the social interactions of researchers and their students. For somebody, like me, coming from an eScience/eResearch organization, there’s plenty of food for thought here. Setting up new research projects and collaborations has always been a matter of serendipity: meeting the right people at the right time. 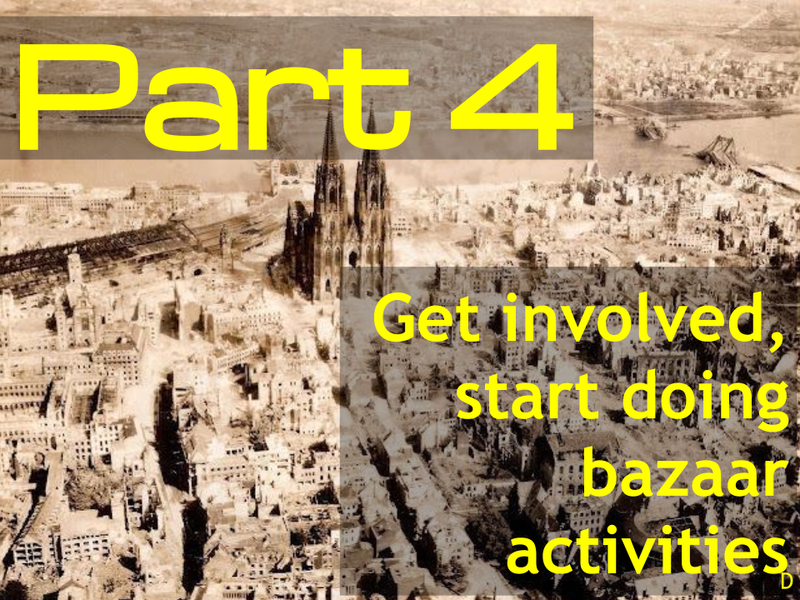 The sort of activities you describe might, for us, not only be aimed at supporting researchers in their use of IT but could also more deliberately engineer the creation of new projects. I’m from Cambridge, so I can confirm your comment on the social environment at Oxford and Cambridge colleges being an interesting model to follow. At least, it can work well for established academics and students: not all post-docs have a college affiliation. For many, their work is centred around the department (as distinct from the college) where they’re more likely to pick up new skills and techniques informally from their peers, office/lab mates etc. There is a need for evidence that your approach is successful and you’re right to wonder what sort of metrics are appropriate. For us, that would be number of funded projects and grant income that can be traced back to these support activities. We’ve also asked more distant collaborators and users of services provided by us to acknowledge this in publications. This is another metric that the powers-that-be understand, of course. A little ‘bugbear’ of mine recently is when people say they are ‘working with data’ – to be clear you are working ON data VIA a tool (not WITH data). In short, you are not actually editing the 1’s and 0’s of binary data. Recognition for the extremely polymorphic nature of data is needed as humans are utterly incapable without the heavy lifting of machines to work on data. There needs to be clear recognition that it is the technological advancement of digital tools that have enabled us to work with data. Without the machines there is no way to work with the tsunami of “big data”. Furthermore, the disciplines that are doing the most significant things with data are the ones who have moved beyond working with a spreadsheet like Excel. Disciplines who are achieving real discoveries with data (thanks to machine digital tools) are: Statistics using R, Engineering using Matlab, Genomics using the proteome browser, Physics, physics and physics, etc. If we are looking to be reductionist about it, I think we could sub-divide subject-disciplines into groups who are still attempting to work with data via ‘one size fits all tools’ such as spreadsheets (the Data 1.0 group), vs groups who have converged on a set of tools that have built in patterns for working with data across disciplines such as R, SPSS, MatLab, etc (the Data 2.0 group), vs groups who have created their own bespoke tool and are widely used via in depth methods such as Physics and use of tools at CERN (the Data 3.0 group). One of the long term objectives (a decade+) of #ResBaz is to help disciplines move from being a Data 1.0 group to a Data 2.0 group to eventually a Data 3.0 group. = another rant forthcoming is the generalities we are using for talking about data as though it were as simple as ‘solving the big data problem. The tools that fascinate me are not the big data tools (Hadoop, BigTable) but the tools that are working with granular data, fast data, error-prone data, multi-hierarchy data, predicate rich data, etc. etc. By hanging out with Humanities researchers we realised how interested they were in having a nice map for the front page of their research paper to engage their readers. By hanging out with researchers we were able to spot their top tools of choice or tools they had heard about using and aspire to use. Not alot, asking for help and using problem based learning is a great way for everyone to learn together as a collective brain. They’ll come and go, ideally you can hand them off to a champion that emerges during the #ResBaz engagement period. Thar’s the rub, right now we can count smiling faces who are using new tools, but more significant metrics are needed. New tools are easier to introduce, rather than replacements for tools researchers have used for a long time, e.g. replacing Word with GoogleDocs is a tough sell. That’s a good question, more than department I think it is about the ‘community wrangler’ who is able to talk across all of these departments.